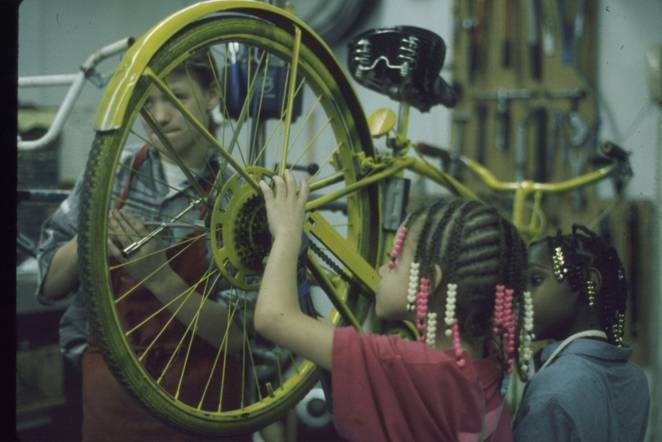 Recently, Lost Oregon dug up some fun video archives about the Yellow Bike Program. We sat down with Brian Lacy, our founder, to chat about the Community Cycling Center’s involvement with the program. Although the Cycling Center eventually pulled away from the Yellow Bike Program, Brian spoke of the hope and optimism that providing free bikes brought to our community. My involvement—and more appropriately the Community Cycling Center’s involvement—with the Yellow Bike Program comes from an organization called UCAN. There were two guys from UCAN and they “owned” the program. The Community Cycling Center’s involvement was providing tools, volunteers, and some parts to put the bikes together. The genesis, what inspired them to do it, was two-fold: 1) They had Vera Katz‘—who was then mayor of Portland, Oregon—official support for the program, and 2) They had been reading about the white bike program in Copenhagen, which had similar issues. 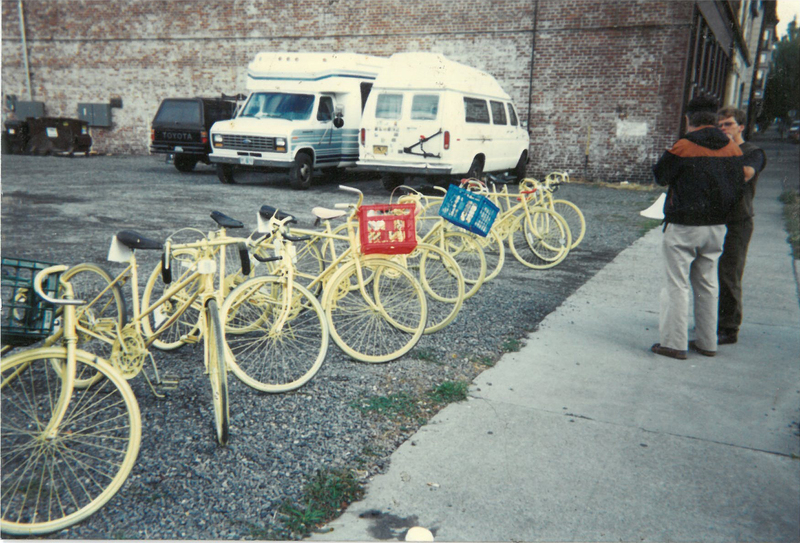 White bikes, in the Copenhagen example, were thrown into canals, and similarly Yellow Bikes were sometimes thrown into the Willamette River or dismantled due to vandalism and abuse. Long story short, Multnomah County had some property at Killingsworth and Martin Luther King that they provided for the Cycling Center and UCAN to come together and put together really basic bikes: one gear, brakes, a seat, and pedals was all I was really looking for. For those people who don’t know what the Yellow Bike Program was, it was the idea that you would provide bikes for free, put them out on the street (so they’d have a kickstand, ideally), and you could ride them when you needed them but when you were done with it, you would just leave it where you were done and then begin leading a non-bicycle life (the rest of the day would be non-bicycle). And then someone else would say, “Oh, a yellow bike unattended where I need a bicycle.” Person 1 would ride from point A to B and they’d leave it. And person 2 would find a bike at point B and ride wherever they wanted. It’s just like Zipcar, only with bicycles and free. So, inherently, it has issues. People who always want to bike, or don’t want to share a bike, would either put a lock on it or whatever they wanted. These are really basic bikes. So if they were homeless folks or really low-income people, great! We provided two wheels that are functional for someone to get from A to point B more quickly and efficiently than they would just by feet. It caught a lot of heat. I appreciate Vera Katz for sticking her neck out and saying, “Hey, this is a great idea.” She did a proclamation, “We support Yellow Bikes.” It was picked up by the New York Times. It received a flash of press. It had a moment of high glory. It is really hard to put out any volume of bikes and have them stay safe. My approach was: lets have a program where we can write some grants, have some teenagers or young adults be neighborhood liaisons who could fix bikes that are left in their zone to help with the upkeep (damaged wheels or flats, etc. ), and address the issue of abuse of property and the privatization of property. There’s a great story that I can relay here. There was a guy who did not want to leave his Yellow Bike. He would call it “his bike.” He leaned his bike up against the wall and had gone in to purchase something. Someone else noticed that this bike was unattended and was wanting to take it. In the process of them trying to take it away, a person in the store who was just riding it came out and said, “Wait! That’s my Yellow Bike!” There was a policeman nearby. The person who had left the bike and had gone in the store and popped out, turned to the cop and said, “Hey, that’s my Yellow Bike!” and the cop said, “Well, if I understand the program right, as soon as you leave the bike, it’s anybody’s bike. So the second guy can take the bike.” It’s all hearsay, but assuming this little moment in the universe happened, that was perfect! That’s exactly what the Yellow Bike Program was intending to provide: need it, leave it, somebody else can take it. Ultimately, the Community Cycling Center pulled away from the Yellow Bike Program because there wasn’t enough infrastructure to sustain it. You can’t just push out a bunch of bikes with limited maintenance. There wasn’t really a program behind it, just pushing out bikes. It was okay for some, but it wasn’t where I wanted the organization to be, so we pulled back. As far as whether the Yellow Bike Program has any association with bike share that Mia Birk does with Alta, I have no idea. You’d have to ask Mia whether that was in any way an inspiration for her. It’s a really different model. I would ultimately say no because everything about it is really different. The Yellow Bike Program is very much like share-a-bike but it’s share-a-bike in a really utopian sort of environment. I love the idea of Yellow Bike: providing free transportation for people. My concept then would be the same as my concept now. If you’re going to do something like a free bike program, then you have to go into it with a big media campaign saying these are free, basic bikes. Yes, they can be abused, but these programs, if they are used properly, will provide some employment for young adults who are going to be trained by us to fix and identify bikes that are in need so that they will stay on the road more often and more successfully. Use that approach as a way of pushing against and helping make more acceptable the sort of the anarchistic or communistic sort of feeling of providing something free that’s good for everybody to use if they want, sort of like air. It’s a great idea, but naysayers are going to say, “It’s going to be so abused and people are going to throw them away, and they’ll be unsafe.” All of these things could potentially be true. But if we want to have a better society where we can trust and rely on each other, having a free bike that you can take from A to B that you can treat appropriately and not want to have as your own, but just release into the greater Portland world for the next person to take it where they want to take it and that that bike is maintained by someone who is employed to do so, it’s a great sort of perfect little circle if it’s not abused. Hopefully that sort of suppresses both the language as well as the practice of abuse. Watch our 20th anniversary video featuring an interview with Brian Lacy.